Day of the Tentacle is the sequel to Maniac Mansion. The game takes place in the Edison's mansion over three time periods (200 years in the past, the present, and 200 years in the future). The only characters that return from the first game are the nerd Bernard, the Edison family, and Green and Purple Tentacle. When Aaron Giles ported this game to the Macintosh, he also ported the original Maniac Mansion so Macintosh users could have the original game in their Day of the Tentacle games too, since LucasArts included the complete original PC Maniac Mansion in Weird Ed's room as a bonus. Maniac Mansion had never been released on Macintosh up until this point. 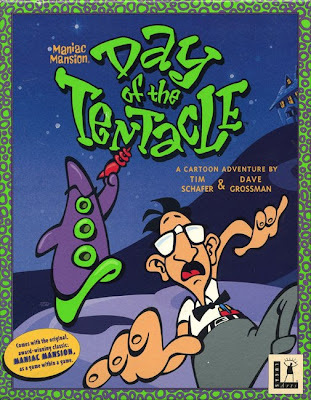 The original version of Day of the Tentacle is out of print, but since it was released at retail, it can still be purchased on the used games market. There's good news for those looking for an affordable and easy way to obtain the game however, as even though the high resolution Day of the Tentacle Special Edition remake that was in the works at LucasArts Singapore was revealed to be canceled in 2013, Double Fine created their own Day of the Tentacle high definition remake, Day of the Tentacle Remastered. It was released for Windows, Mac, PlayStation 4 and PlayStation Vita on March 22, 2016. A Linux version was released shortly afterward. The original version of Day of the Tentacle is now supported by ScummVM, a program designed to let 2D adventure games run on multiple platforms. With ScummVM, Day of the Tentacle now runs on modern versions of windows, as well as Linux, Mac OS X, and many consoles such as Dreamcast, Wii, PlayStation 2, and PlayStation Portable. For a complete list of platforms supported by ScummVM, see here.